Marc had played guitar since the age of 9, but started to pursue music more seriously around 1964, when he became Toby Tyler, covering songs by Bob Dylan, and Dion. (A track recorded around this time as Mark Feld, "All At Once" has recently been discovered will be released soon.) In his teen years, Marc became known as one of the first "mods". This led him to a brief stint as a model, and he chose to leave school when he was 14 years old. He also played guitar in a band called John's Children. Marc was needed for this group as a 'Pete Townshend' figure, but after 3 months, he left the band. Together with Steve Peregrin Took, he formed his own duo Tyrannosaurus Rex, which quickly gained a large underground following. After 3 successful albums, Steve Peregrin Took's drug habits and suggestion of doing some of his own songs was enough for Marc to kick him out of the duo. Mickey Finn quickly replaced Steve, and the new duo recorded the album A Beard Of Stars, with Marc replacing Steve's backing vocals on the tracks they already began recording. On Marc's second album with Finn, he decided to shorten the name of the band to T. Rex, and found fame and chart succes in 1970 with Ride A White Swan. 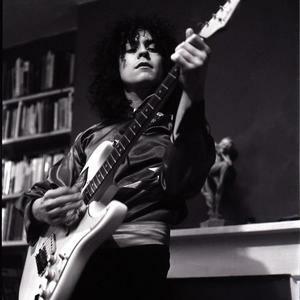 Marc Bolan tried to make it clear during his lifetime that he was NOT to be grouped in the lot called Glam Rock. In 1973, he appeared under the headline "Glam Rock Is Dead: Says Marc" - he felt he was not being treated seriously as an artist, so with Zinc Alloy onward, he moved into a Rock & Soul sound, radically different than what was the musical trend at the time. Many of Marc's fans stayed behind with the Glam movement, but Marc pursued further into less commercial music adventures, with the help of his soul-singer girlfriend, Gloria Jones. Together they had a son, Rolan Bolan, in 1975. Tragically, Marc died in a car crash on 16 September 1977 in a purple Mini driven by Gloria Jones.